An A-Z of seamanship skills needed to understand and enjoy catamarans and trimarans to their utmost. Racing and cruising yachts are catered for, as are trailer-able multihulls. Derived from the author's own extensive experience, built on through others sharing their knowledge and... read full description below. 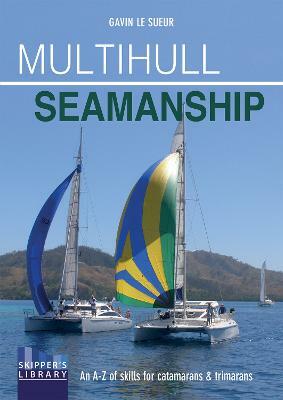 This is an A-Z of seamanship skills for multihull sailors. There are many textbooks on the market which detail general seamanship principles. This is not one of them. Multihull Seamanship is about sea-going catamarans and trimarans and the skills needed to understand and enjoy them to their utmost. Both racing and cruising yachts are catered for, as are trailer-able multihulls. Seamanship is not a black and white skill. It is an evolution of knowledge; a building of information through experiment, thought and experience. There is no definitive word on an evolving skill. Multihull Seamanship started as Dr Gavin Le Sueur's personal index of `how-to's. It has grown through experience and others sharing their knowledge. It should be on the book shelf of every catamaran and trimaran. This book is for people who are already multihull sailors, or for those who are contemplating multihull sailing. It has served this community for over 20 years and this second edition is fully updated. It is illustrated with delightful line drawings by Nigel Allison. Gavin Le Sueur built his first multihull, a 16 ft Mosquito catamaran, while at high school. After graduating from Melbourne University in Medicine, he purchased and moved aboard a 35 ft Hedley Nicol `Wanderer' trimaran. To learn as much as possible about multihull sailing he decided to compete in the two-handed bicentennial Around Australia Yacht Race with his future wife. For this adventure they obtained the then fastest offshore racing catamaran in Australia - a 37 ft Crowther Super Shockwave named D Flawless which they raced in many Southern Ocean races. In one of these they sailed through the eye of a cyclone and completed the race only to be struck by a whale when sailing back home and forced to abandon ship. They were lent another catamaran for the gruelling around Australia race which they completed, getting engaged on the finish line. Since then they have owned 5 different catamarans in which they have cruised and raced in Australia and explored the Pacific and south east Asia.